On Friday, September 16th, the Office of Environmental Policy and UConn Athletics co-hosted Green Game Day, an environmental awareness campaign that encourages fans to do their part in reducing the footprint of UConn Athletic events. Thirty volunteers collected recyclables from tailgaters and educated fans about the importance of recycling. As much of the estimated eight tons of garbage produced at each Husky home game is recyclable, this event significantly contributes to reducing UConn’s environmental impact. Additionally, a student-run booth featuring a green initiatives display further enthused fans by providing them with recycling bags of their own. 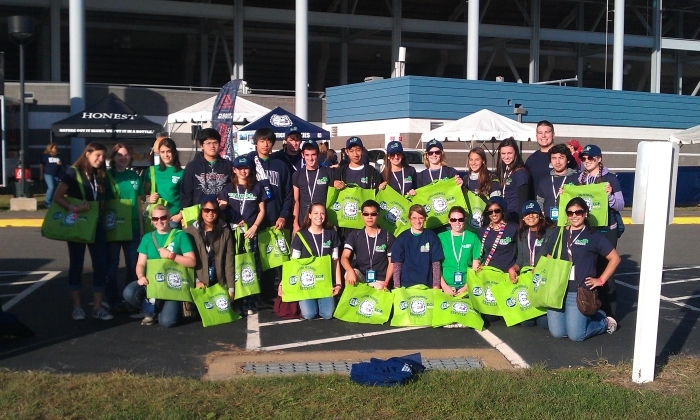 A group shot of the Green Game Day volunteers.